The National Board for Certified Counselors offers the National Clinical Mental Health Counseling Examination (NCMHCE) for the purpose of getting credentialed in particular states. The NCMHCE test includes ten case studies which have been created to cover a wide range of experiences, so it is more than just remembering particular information. Candidates must be able to evaluate the case and use their skills with handling problems. Candidates must be able to recognize, assess, diagnose and determine a plan for the problems that are provided. Evaluation and assessment – Recognize what is bringing on the problem or what the patient indications are, do an assessment of the person’s mental status, get a complete biopsychosocial assessment background and recognize individual and relationship functioning. Diagnosis and treatment planning – Incorporate evaluation and observational information together with clinical judgment and come up with a differential diagnosis, create the treatment plan by collaborating with the person, put together a treatment plan that different service providers will participate in, and keep a check on how the person is doing in terms of meeting the objective. Clinical practice – Resolve whether the service has met the person’s needs, thrash out ethical and legal issues, and show comprehension of the extent of the candidate’s practice (including limitations). How to pass the NCMHCE Exam! SimulationMark, a 25-year-old Caucasian male, calls for an appointment without disclosing any specific concerns. He works for a barber and beauty supply business, and drives a local delivery route in and around the city in which he resides. He has been married for two years, and he and his wife have one newborn child. NOW GO TO SECTION A.Section A: Initial Information Gathering. The client seems reluctant to reveal his reason for seeking counseling. What might you do and say to put him more at ease? DIRECTIONS: Select as many as you consider correct. 1. Can you tell me what’s on your mind? 2. Do you have any concerns about seeing a counselor? 3. Shall we discuss my fee schedule? 4. Who referred you to see me? 5. Most people seeing a counselor just need some feedback about their lives. What brings you in today? 6. Do you understand that homework may be required? DIRECTIONS: Select the arrangement likely to be helpful to the client at intake. 1. The counselor and client seated at an angle from each other with nothing between them. 2. The counselor and client seated across a desk from each other. 3. The counselor seated directly in front of a diploma and certification plaques to reassure the client. 4. The counselor standing and pacing while talking to the client. 5. The client recumbent on a couch while talking with the counselor. NOW GO TO SECTION C.Section C: Diagnostic Formulation. Identify the most likely diagnosis, given the available information. DIRECTIONS: Select the single most likely diagnosis in this situation. 2. Adjustment Disorder with Mixed Disturbance of Emotions and Conduct (309.4). 3. Substance-Induced Anxiety Disorder (292.89). 4. Acute Stress Disorder (308.3). 5. Generalized Anxiety Disorder (300.02). NOW GO TO SECTION D.Section D: Optimum Treatment Modality. From among the following, indicate the best treatment approach. DIRECTIONS: Select the TWO most appropriate options provided in this Section. 1. Engage the client in insight-oriented psychotherapy. 3. Refer the client for electro-convulsive therapy. 4. Refer the client for a medications evaluation. 5. Begin a regimen of behavioral therapy. NOW GO TO SECTION E.Section E: During the client’s medication evaluation, you discover that the psychiatrist you normally refer to is unavailable, and another clinician is temporarily cross-covering her referrals. Upon returning, your client informs you that the cross-cover psychiatrist has enrolled him in a medications study to investigate the effectiveness of a new medication. He has been randomized into a group that could receive either a placebo or the investigational medication. Describe an appropriate first response to this information. DIRECTIONS: Select the one most appropriate first response in this situation. 1. Rely on the investigational physician to resolve any subsequent concerns about Mark’s treatment via the research study. 2. Ask Mark if he understands the purpose of the study. 3. Tell Mark that he needs to drop out of the study if he intends to continue working with you. 4. Consult with the physician (via information release) about Mark’s safety concerns in driving. Section A: Element Relevance and Initial Information Obtained. Can you tell me what’s on your mind? This question is open and non-threatening, and it allows the client to easily express his concerns in any way that suits him. Do you have any concerns about seeing a counselor? While this is a forthright question, it presumes the client is worried about seeing the counselor, and may prompt a defensive (or overly reassuring) response. Shall we discuss my fee schedule? This question could be seen as downright disrespectful and suggests that the client is either miserly or else unable to afford the counseling services. Who referred you to see me? This question could be perceived as an attempt by the counselor to pursue marketing and referral concerns, instead of voicing genuine concern about the client and his reasons for being there. Most people seeing a counselor just need some feedback about their lives. What brings you in today? This question “normalizes” the clinical engagement process, and then allows the client to frame a response in his own way. Do you understand that homework may be required? This question suggests that the client is either lazy or resistant, or both. Therefore, it is not an appropriate intake question. Section B: The value and relevance of potential information to share. This spatial arrangement suggests equality, and an open engagement process. This spatial arrangement suggests a professional barrier exists between the counselor and client. This suggests either an attempt at professional dominance, or an effort to cover professional insecurity. Neither will benefit the encounter. While the presence of credentials can be appropriate, the placement should be non-threatening. Pacing in the presence of a client would be distracting, agitating, and suggest a marked lack of interest and investment in the client. This posture would not be effective for an intake session, unless a client personally requested it or was not feeling well. Using an appropriate pattern of questioning and an optimal spatial arrangement, the client now reveals his concerns. He has been driving a delivery truck for nearly one year. He now knows the route very well and is comfortable with his assignments. However, in recent months he has begun to experience problems. He has had a recurrent fantasy or “daydream” of what it would be like to “go back in time” with modern accoutrements (his vehicle, clothing, knowledge, and the like). While the fantasy was just “good fun” in the beginning, it has begun to “take over” his thinking. Recently, it has become so intrusive and preoccupying that he has begun missing deliveries and is less than fully safe on the road. He is seeking help in coping with this situation. As he speaks, it is clear that he is embarrassed about what is happening, and yet overwhelmed by it enough to seek help. He is fearful of losing his job, or perhaps even getting in an accident and injuring others and himself. Section C: Relevance of Diagnosis Options. 1. Adjustment Generalized Anxiety Disorder (300.02). The client’s issue is very specific, and beyond this diagnostic category. If any other Axis I disorder better fits the symptoms, then this diagnosis must not be applied. In this situation, there is a better fit. There is no indication of substance abuse. There is no precipitating “traumatic event,” which is the core feature of this diagnosis. For this diagnosis to apply, the focus of the client’s “anxiety and distress” must not be “confined to features of [another] Axis I disorder. In this case, there is another Axis I disorder that is the source of the client’s distress. 1.Engage the client in insight-oriented psychotherapy. Insight-oriented psychotherapy has a poor track record in modifying OCD symptoms over the long term, although it may offer some short-term emotional benefits and support. Because the client’s issue is primarily a thought-based obsession (as opposed to a behaviorally-based compulsion), this therapeutic approach is optimal. Using a cognitive restructuring approach, the client can be assisted in identifying the various triggers and disruptive thoughts associated with his obsession, and can learn to replace them with more realistic, functional thoughts. Given that the issues is being caught relatively early (involving only months, rather than years), the restructuring process should be relatively swift and very successful. This approach is sometimes used in cases of Obsessive-Compulsive Disorder, but it is not typically a first-choice approach. Other techniques and approaches are normally attempted first. The use of anti-depressant medication can be a particularly effective adjunct in the treatment of Obsessive-Compulsive Disorder. Therefore, a referral for a medications evaluation would be most appropriate. If prescribed, a monitoring and feedback component would be an important part of any treatment plan. Behavioral therapy alone is more appropriate for situations where persistent compulsions are evident. However, where behavioral compulsions are absent, as in this scenario, the process of cognitive restructuring is a necessary addition to any behavioral treatment components used. Section E: Disposition Relevance and Rationale Formulation. While some discussion of the client’s understanding of the study may be in order, it is not the most pressing issue for further address. As emphasized in the NBCC Code of Ethics Section B, #8, requires that a counselor take “reasonable steps to ensure that clients understand the implications” of any intervention being used. By enrolling the client in the investigational study, the possibility exists that the client will be randomized into a placebo (no medical treatment) group. This could result in the client receiving less than adequate available treatment. Given that the client has explicitly stated he fears for his driving safety when engaged in his obsessive thoughts, this concern must be addressed further. Specifically, the NBCC Code of Ethics Section B, #4, stipulates a counselor “must take reasonable action” if there is “a clear and imminent danger to the client or others.” The NBCC Code of Ethics Section B, #2, emphasizes the need for a formal information release for consultation between colleagues to take place. 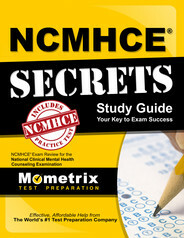 Ace the NCMHCE test using our NCMHCE exam study guide with practice questions. 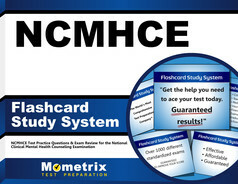 Quickly Solve Difficult NCMHCE Test Questions with the NCMHCE Flashcard Study System.